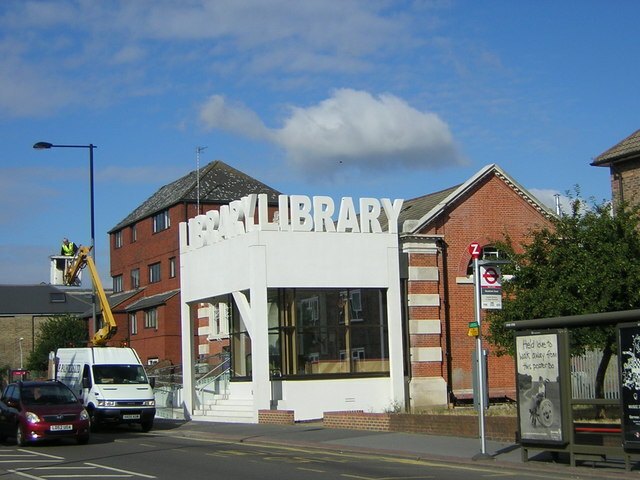 Croydon's battered library system has not been exactly the envy of the world recently, closing six branch libraries and handing over the rest to be managed by John Laing Integrated Services, promising - you guessed it - investment in IT services. They finally took over three weeks ago, and just had time to put all the library staff in uniforms, before - hey presto! - they were bought by the service company Carillion. Nobody seems to have informed the council of this, least of all Carillion, and there are now said to be 'discussions', which is only to be expected when you suddenly find your libraries are being run by a company you haven't actually chosen. Where on earth are all the books? Thornton Heath Library has been recently redesigned at vast expense by architects FAT, but - as Sarah said when she arrived back - we've got more books in our house than they have. I have noticed over the years that one of the first signs of a failing school is when the books start disappearing, usually replaced by gleaming computers - though there are precious few of these in the libraries either. It is a wholesale replacement of content with process, precisely the same disease which public services suffered from during the New Labour years. So how are we to understand the news, revealed today by Apple chief executive Tim Cook, that sales of iPads to UK schools doubled in the last year (though Apple's profits are still falling)? My nine-year-old has been remarking at his primary school about how there are now iPads everywhere, so something strange is going on. So. Is this another example of the replacement of content with process, in a way that even McKinsey would approve of? Or is it an early warning sign that UK schools are going the same way as UK libraries - a hollowing out leading to a decline? And before you accuse me of cynicism, ask yourself where the money is coming from. Was the Pupil Premium really intended to prop up Apple's profits? Thank you for drawing attention to one of the tactics of those councils that are intent on getting out of providing Public Libraries. In some places it will be councillors, in some places it will be senior officers and usually it is just lazy budget practice. It is dead easy to trim a council budget by shutting Libraries, by failing to buy new books or properly maintain the existing book stock or by shutting the Libraries for more days of the week than there are pen. Selling off Library buildings can produce easy capital gains for unscrupulous and lazy councils. Wrap up all this in the excuse that kids don't read books and any way computers are the future and you can get away with murder; cultural murder. Thank you, John. Good to hear from you!